ECDPM. 2016. ECDPM work plan 2017-2018. Maastricht: ECDPM. As stated in ECDPM’s 2017–2021 strategy, “partnerships. practical solutions and coherence” will be crucial to accomplish the Global Goals for Sustainable Development by 2030. Managing global challenges requires countries, and disparate groups within them, to work together. Common and competing interests will have to be negotiated, political deals concluded and adequate regulation put in place. For these purposes, promoting multi-stakeholder dialogue and evidence-based joint action will be key and are also central to ECDPM’s contribution. 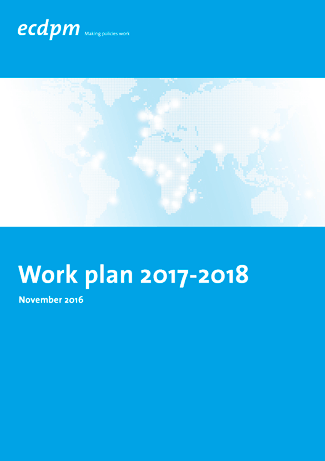 This work plan outlines how ECDPM will fulfil its mission to make policies work for sustainable and inclusive global development. It covers the first two years of our upcoming strategic plan period. Inspired by the United Nation’s (UN) 2030 Agenda, the Centre’s strategy sets out four related key impact areas (KIAs) to which it will contribute: (1) effective international cooperation frameworks, (2) legitimate and accountable institutions, (3) peaceful societies and (4) sustainable economic transformation. These link in particular to five of the seventeen Global Goals. ECDPM’s strategy furthermore describes the international context in which we work and outlines a Centre-wide theory of change (ToC) that clarifies how we will work to achieve impact.